Silk is soft against your skin and responds well to changing temperatures - it feels cool in the summer and is warm in the winter. 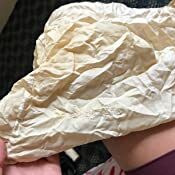 Mummy Liners made of silk are easy to hand or machine wash and dry quickly. 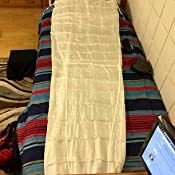 Marycrafts 100% Pure Mulberry Silk Single Sleeping Bag Liner Travel Sheet Sleepsack 83"x33"
It's all silk. The 95 inch size is plenty big for my 6' body. The cut is large enough to get in and out easily, not overly restrictive, but definitely a mummy cut. Silk weight is the lighter weight you would find in a lightweight shirt, not heavy weight like a dress or sheets. My main complaint is the stitching. This lacks any kind of quality control. The seems are pretty basic and a bit rough for this price point. The stitching ran off the seams in several locations so I'll need to repair those otherwise it will pull apart. The hems needed to be finished properly to justify a $50+ price. I would put this at a square deal at $35, at $70 it's far overpriced. The stuff sack is nice, but I won't use it since I'll just stuff this together with the down bag it goes in. It's about the size of a water bottle. Half the sack is the same silk, so I fully expect it will pull apart in no time. 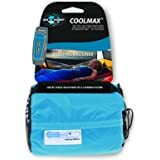 Great product- this added much needed insulation to my sleeping bag and gave me an extra layer of super soft comfort (which can't be overlooked as one sleeps on the hard wooden floor of a shelter on the Appalachian Trail) AND it's Pretty Too! 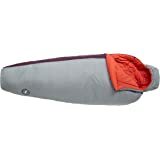 The bottom is narrow to mimic the style of the cocoon sleeping bag and reduce bulk. 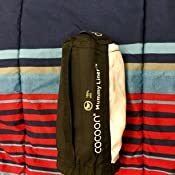 The way I found most useful to utilize this was to set up the sleeping bag, partially unzip is. Sit next to the sleeping bag and pull this up over my feet & legs & hips. 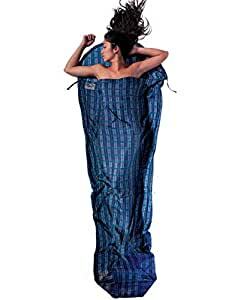 Then I inserted my freshly Cocooned feet into the sleeping bag and wiggled my way down and into the sleeping bag while pulling the liner up and over my back. Throughout the night as I moved around I would periodically wake due to my shoulder being chilled, why? Because the Cocoon Silk Liner had shifted down exposing my shoulders. As soon as I pulled it back up, I was warm & cozy & ready for more snoozing. 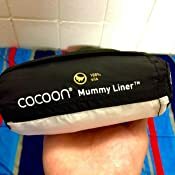 TIP: The Mummy Liner has a hood area and I figured out on the second night that I just needed to pull the back ALL the way Up and it no longer slid down my shoulders, it stayed put!. 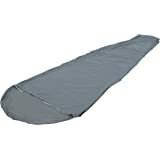 5.0 out of 5 starsGreat liner that can mitigate your neurosis of sleeping between hotel sheets. I bought this liner to use in a hotel during a stay for a conference. It was a nice hotel, but I'm weird about sleeping on/under the sheets of a hotel bed. This was a nice way to prevent the sheets from actually touching my skin (I know, weird right!?) Anyway, the liner is very soft and gave me enough room to move around. I've 5'8" and it was long, but I thought the top section could have been a little longer. The liner if very slippery which makes it kind of hard (for lack of a better word) to move around while tossing/turning during normal sleep. When I would try to turn during sleep, the liner would move with me and end up twisted. It's hard to explain the experience. The liner is very thin and I did have to cover myself with the hotel sheets and quilt due to the cool air from the air conditioning. I was able to repack each day into it's original sack (about the size of a 12oz can of soda). I chose this liner over pricier liners and never questioned the purchase. I see no need to spend any more than what I paid for this (I think about fifty US dollars). I've bought three of these now. They are washable, durable, optional and let us adjust our sleeping gear up and down temperature range to match the weather and the person. 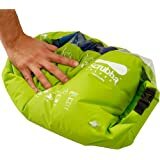 I think these are must have items just because it's such a problem to wash sleeping bags and honesty for an expensive sleeping bag it's just not worth washing them. 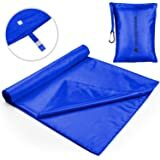 We first bought one of these to take summer camping for the person who gets cold easy and it stuffs down to the size of a pop can so if doesn't get used (it did) that's fine. We feel the 10F additional degrees is probably accurate. By the way, the price these things jumps around a LOT so it pays to watch for that $10 down shift and time your purchase. 5.0 out of 5 starsWay better than Cotton, Small and Light. 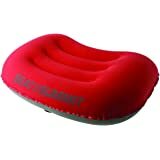 Super lightweight, small, and way nicer feel than the inside of a sleeping bag. 10/10 would buy again. For $50 bucks it's totally worth it over a cotton liner. Only the size of a soda can too. The product is well made and quite sheer. 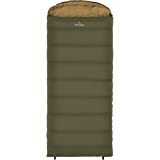 For me I think the best use would be to provide a barrier between my body and the sleeping bag to keep the bag clean on extended warm weather hikes where bathing is not possible. On cold outings where I will be wearing full length sleep gear I will not need it for cleanliness reasons. 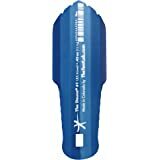 I feel the product provided a very small measure of added warmth inside the sleeping bag so other means to achieve that will be my choice. 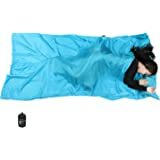 It can be difficult or at least a little time consuming to coordinate getting into the liner and the mummy sleeping bag when in the close quarter of a one person tent. It is quite comfortable and provides a better feel than the inside of the typical down mummy bag. Recently took this on an 8 day backpacking trip and couldn't have been happier. 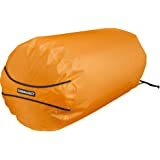 It is super lightweight, packed it down in the sleeping bag stuff sack without any extra bulk. It made a huge difference in the cooler nights. Also was perfect to cover my face when the nights got extra cold and once when wind was blowing tiny particles of dust into the tent. And now home I can simply wash the liner and the sleeping back is clean as ever. This definitely makes a difference for comfort and therefore it must for survival. The biggest plus is its a layer between you and the bag that is super easy to clean. 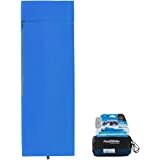 Get one for hygiene, without a doubt, maybe get a thicker one for making your sleeping bag more comfortable in the cold. 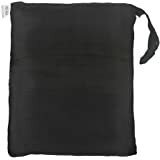 I have a 0 degree bag from the late 90's that I use with this and it keeps me warm in 32 and below even with the reduced warmth of an old bag. 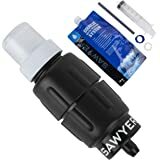 If you're a casual camper or avid outdoors person you're probably going to benefit from this and if you're doing such intensely cold camping you're probably not the person who is reading amazon reviews anyways. Get it!